In a fragmented and somewhat unorganized global electrostatic discharge (ESD) packaging market, savvy players are seen embarking upon mergers and acquisitions to bolster their positions. It has also been noticed that they are trying to increase their geographical footprints through various methods. At the forefront of driving demand in the global electrostatic discharge (ESD) market is the electronics and electrical industry, which require suitable packaging to prevent damage to their products. Besides the electronics and electrical industry, the defense and military segments in developed nations are also serving to stoke demand in the market. On the flipside, metallic powder in electrostatic discharge (ESD) packaging easily corrodes when it comes in contact with water. This, in turn, damages components and devices stored. The problem is having a negative impact on the market. 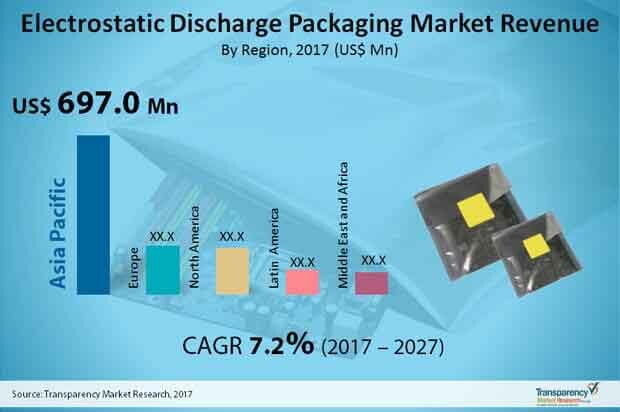 A study by Transparency Market Research, forecasts the global electrostatic discharge (ESD) packaging market to clock a CAGR of 7.2% from 2017 to 2027 to become worth US$2.6 bn by 2027 from US$1.3 bn in the current year of 2017. Depending upon the types of products, the electrostatic discharge (ESD) packaging market can be divided into bags, trays, clamshell, shrink films, boxes and containers, tapes and labels, foams, totes/IBC, racks, and others. Of them, the segment of bags surpasses all others both in terms of value and volume. The segment is expected to grow its value by clocking maximum CAGR of 8.4% from 2017 to 2027 to pull in a revenue of US$841.4 mn by 2027. The segment of foams trails in the second position. By registering a CAGR of 7.0%, the segments is expected to become worth US$418.3 mn by 2027. In terms of growth rate, racks and tapes and labels are forecasted to witness impressive CAGRs – 8.4% and 7.0% – in the forecast period. Based on application again, the key segments of the global electrostatic discharge (ESD) packaging market are electrical and electronic component, equipment, explosive powder, drugs, etc. Of them, the segment of electrical and electronic component is expected to account for 80.2% of the market share by value by the end of 2027. From a geographical perspective, Asia Pacific accounts for a leading share in the global electrostatic discharge (ESD) packaging market. This is because of the presence of the numerous electronic manufacturers in countries of China, Taiwan, South Korea, and Japan. The rising demand for smartphones and IT infrastructure in the region is also serving to boost demand. On account of so many factors boosting market, its value is projected to reach US$1.40 bn by 2027 from US$657.7 mn in 2016 by registering a CAGR of 7.2% over the forecast period. Europe trails Asia Pacific vis-à-vis market share in the global electrostatic discharge packaging market. Its market, which is valued at US$ 201.9 mn, is predicted to attain a value of US$450.3 mn by the end of 2027 by expanding at a CAGR of 7.7% from 2017 to 2027. Germany is primarily powering the growth in the region. Prominent names in the global electrostatic discharge (ESD) packaging market include Smurfit Kappa Group, DS Smith Plc, Sealed Air Corporation, Pregis Corporation, Achilles Corporation, Desco Industries Inc., Storopack Hans Reichenecker GmbH, Teknis Limited, Elcom (UK) Ltd., Summit Container, Corporation, Kiva Container, Delphon Industries, LLC, Protective Packaging Corporation, GWP Group Limited, International Plastics Inc., AUER Packaging GmbH, Dou Yee Enterprises (S) Pte Ltd., and Botron Company Inc. This report provides forecast and analysis of the Electrostatic Discharge Packaging Market on Global level. It provides estimated data of 2017, and forecast data up to 2027 in terms of revenue (US$ Mn) and volume (Tonnes). The report also includes macroeconomic indicators along with an outlook on electrostatic discharge packaging consumption pattern across the globe. It includes drivers and restraints of the global electrostatic discharge packaging market and their impact on each region during the forecast period. The report also comprises the study of current issues with end users and opportunities for electrostatic discharge packaging manufacturers. It also includes value chain analysis. In order to provide users of this report with comprehensive view of the market, we have included detailed competitiveness analysis and company players with their SWOT analysis and strategy overview. The dashboard provides detailed comparison of electrostatic discharge packaging manufacturers on parameters such as operating margin, total revenue, product portfolio, and what we call ‘innovation scale’. The study encompasses market attractiveness analysis by product, application type, material & additive, end user base and region. The report includes consumption of electrostatic discharge packaging and the revenue generated from sales of electrostatic discharge packaging across the globe and important countries. by Product Type (bags, trays, clamshell, shrink films, boxes & containers, tapes & labels, foams, totes/IBC, racks, and others), by Application Type (Electrical & Electronic Component, Equipment, Explosive Powder, Drugs, and Others), by Material & Additive Type (Conductive & Dissipative Polymers, Metal, and Additive), by End User Base (Electrical & Electronics, Automobile, Defense & Military, Manufacturing, Aerospace, Healthcare, and Others). Market numbers have been estimated based on extensive secondary and primary research, average pricing of electrostatic discharge packaging, by product type and the revenue is derived through regional pricing trends. Market size and forecast for each segment have been provided in the context of global and regional markets. The electrostatic discharge packaging market has been analyzed based on expected demand. Prices considered for the calculation of revenue are average regional prices obtained through primary quotes from numerous regional electrostatic discharge packaging manufacturers, suppliers, and distributors. All key end users have been considered and potential applications have been estimated on the basis of secondary sources and feedback from primary respondents. Country demand patterns have been considered while estimating the market for various end users of electrostatic discharge packaging in the different regions. Top-down approach has been used to estimate the electrostatic discharge packaging market by regions. Global market numbers by product, by application type, by material & additive, by end user base and by region have been derived using the bottom-up approach, which is cumulative of each country’s demand. Company-level market share has been derived on the basis of revenues reported by key manufacturers. The market has been forecast based on constant currency rates. Key players in the electrostatic discharge (ESD) packaging market include Smurfit Kappa Group, DS Smith Plc, Sealed Air Corporation, Pregis Corporation, Achilles Corporation, Desco Industries Inc., Storopack Hans Reichenecker GmbH, NEFAB Group, Teknis Limited, Elcom (UK) Ltd., Summit Container, Corporation, Kiva Container, Delphon Industries, LLC, Protective Packaging Corporation, GWP Group Limited, Pure-Stat Engineered Technologies, Inc., International Plastics Inc., AUER Packaging GmbH, Dou Yee Enterprises (S) Pte Ltd., Botron Company Inc.